Active shutter 3D technology can be expensive, particularly if you want to cater to a large audience, but what if you could convert an active shutter 3D projector into a passive one? Then you could use the dirt-cheap passive polarised glasses of the sort you get in cinemas. This is the idea behind the PolaRotator from 3D Experience. Think of it as an active shutter ‘window’, which sits in front of the projector, synchronising with the alternating 3D frames, and turning them into circular-polarised images which can be viewed with cheap passive glasses. The system consists of the PolaRotator LCD device and stand, a driver box with controls for sync rate and eye reverse, and cables to connect to the VESA output of the sync source – which in our case was Optoma’s 3D-XL converter – check with 3D Experience for compatibility with other projectors. Our demo Optoma projector and 3D-XL convertor (normally viewable with active shutter spex) produced excellent 3D images viewable with cheap polarised glasses. 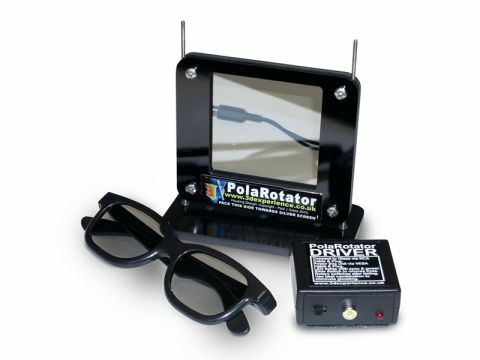 The PolaRotator was also easy to set up and use, though some adjustment of the PolaRotator is necessary to get just the right angle for maximum effectiveness. However, it’s not cheap; at this price it could only be viable for the pub, club or educational markets. It's also worth noting it needs a special ‘silver screen’. Ordinary projection screens scatter light too much for the polarisation effect to work. The distributor offers a range of laminated board portable screens up to 84-inches, or if you’re really serious you can buy material and make your own. Also, no glasses are supplied (even for testing purposes! ).